With so many people looking to lower their energy bills, a lot of HVAC myths have been circulated. While some of these myths seem helpful at first, they end up causing more harm than good. 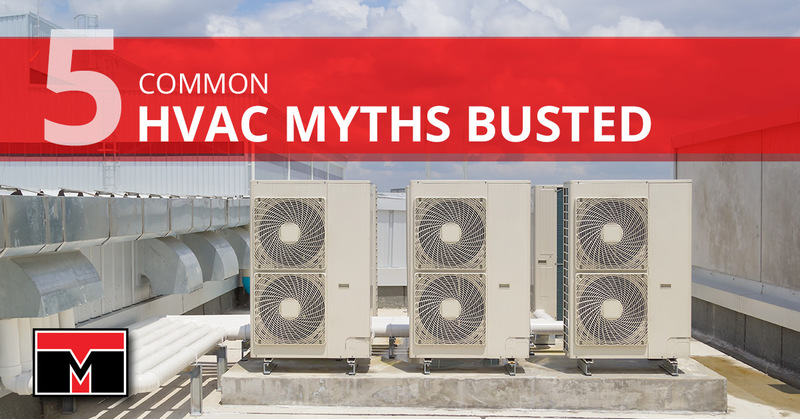 With that in mind, we have gathered five of the biggest HVAC myths we’ve heard, along with the truth about them. To maximize your HVAC system’s potential, call Tippetts Mechanical today! Our HVAC gurus want to make your house into an efficient and comfortable home. While this may appear to be the truth at first glance, it actually doesn’t have the effect you would like it to. When you close off the vents, air pressure within the ducts will increase. When ducts encounter too much air pressure, seams can start leaking, and the cool and warm air will be sent where it shouldn’t be. That means you’ll end up losing money instead of saving it. One of the biggest misconceptions we’ve seen is the belief that it takes more energy for an HVAC unit to start up than it does to keep it running. We’re not sure where this came from because it couldn’t be further from the truth. Running the air conditioning or heat for extended periods uses a consistent level of energy that never stops, whereas starting up a unit is comparatively light on energy. You save more energy and money when your unit is completely off. A programmable thermostat is an inexpensive solution that allows you to set the schedule for when your unit turns on and off while you’re not at home. We’ve heard it hundreds of times while we’re performing repairs. Routine maintenance was ignored because, as they say, “If it ain’t broke, why fix it?” The problem with that mindset is it will result in your HVAC unit getting damaged, and the price of a repair will go up higher than if you just went with routine maintenance. When you skip maintenance, you’re reducing your unit’s lifespan, and it will exert itself harder to make up for issues it encounters. That means your energy bills will skyrocket, too. Even if you don’t think there’s anything wrong with your HVAC unit, it’s important to schedule routine maintenance for at least twice a year. That will ensure it operates properly for years to come. Even though you turned your thermostat to its lowest or highest level, it won’t make it work any faster. Your unit will just cycle on and run until it reaches the temperature that you set it to. It will be easier on your unit if you gradually lower the temperature to allow it time to get running. When an HVAC unit is using a dirty filter, not only will air quality be affected, but airflow will as well. This makes your unit work harder than it needs to in order to move the air through your home. That increased workload will reduce its lifespan, which means you’ll have the high price tag of replacing it to contend with. When you consider how affordable an air filter replacement is, it’s silly to ignore it. We recommend you either replace or clean your air filters at least every other month for optimum performance. Whether you’ve been having issues with your HVAC system or you just want to get started on a routine maintenance program, call us at Tippetts Mechanical. Located here in Las Vegas, we have the experience to help your home stay comfortable for years to come.